Gospel Recording Artist, Bonita Burney Simmons, Performed Live at Black History Month Event! Artist returned to her hometown to perform during "Women of Praise Gospel Concert" held in Kinston, NC on Feb 8th. 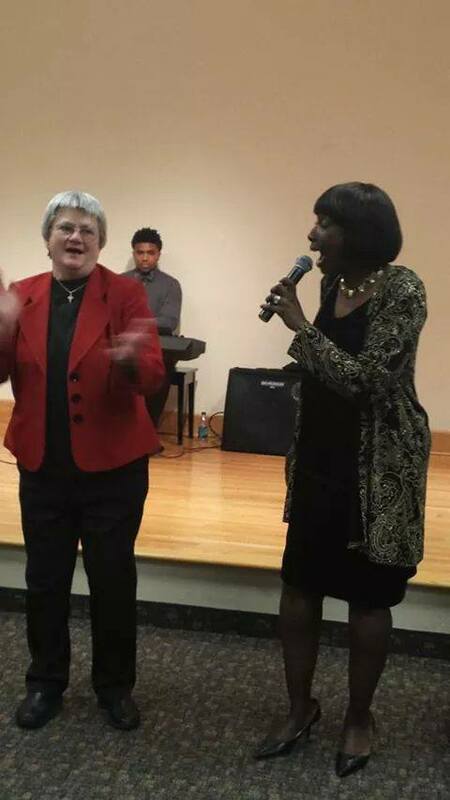 Bonita Burney Simmons - Performing Live @ "Women of Praise Gospel Concert"
KINSTON, N.C. - Feb. 15, 2015 - PRLog -- The "Women of Praise Gospel Concert" was held at the Kinston-Lenoir County Library last Sunday, February 8th. Bonita has received rave reviews and people are still talking about her performance! Bonita is most humbled by all the support received by her fans who came out to support her during this event. When asked to participate in the concert, Bonita was just so honored to be selected. She returned to her hometown of Kinston, NC where she was part of a powerhouse, gospel lineup which included other local, esteemed psalmists like Lessette Kornegay, Shillena Parks and Jamie Taylor.
" I was raised in Kinston before relocating to New Bern. However, Kinston is near and dear to me, and forever will be. So naturally when I received the request to perform there during Black History Month, I was so excited! I can't describe enough how honored I felt sharing the spotlight with such a phenomenal group of women. It was an amazing time of fellowship through song. The synergy that was created on that stage was nothing but the annointing of God. I am happy to have been a part of this historical event and hope to return next year." "I wanted to have a gospel concert at the public library for Black History Month. Our story is deeply rooted in the gospel music, sometimes being the only reminder of a better day through our Holocaust of slavery, Reconstruction, and present day. When I began planning the concert, I immediately thought of four women, to include Bonita Burney Simmons, who has always been the quintessential singer, performer, song stylist. I moved back home to Kinston approximately six years ago and was commissioned to write and produce a play for the North Carolina History Center. I immediately thought of Bonita Burney Simmons to play a role. I had not seen her in probably 25 years or more and knew that she probably did not know me. I knew of Mrs. Simmons' voice and her stage presents, but through my experience co-writing and producing this play, I got to know Mrs. Simmons. Her faith in God and her commitment to living the life she sings and preaches required me to have no one other than Mrs. Simmons be a feature in the Women of Praise Gospel Concert. When it comes to the gospel, I wanted women who would not only sing but also to witness, testify, and bring more souls to Christ." Today, Bonita is enjoying the flexibility of being an independent gospel recording artist. Her talent is in high demand, as she is frequently requested to sing at venues and events throughout Eastern North Carolina! Although she's experienced many tribulations, Bonita's life lessons are part of her unique tapestry that enables her to relate to people who are hurting. One of her biggest accomplishments is her outreach work with those who are incarcerated, sharing God's love through song. Indeed, Bonita has defined her own success, choosing to embrace an obedient lifestyle according to God’s will for her life and career. She simply allows God to do the navigation and depends solely on Him to direct her career path- living by her motto, “If I make the way, then I’ll have to pay the way. But if I allow HIM to make the way, he’ll pay the way!" Gospel Recording Artist, Bonita Burney Simmons, Releases A New Single! Kinston Family Network Celebrates 6th Year Anniversary!